If you crossed Calvin & Hobbes with The Lord of the Rings, the result very likely would be Sabretooth Dan! Check out the sword and sorcery comic that stars an orphan with both sabreteeth and an over-active imagination in a Tolkien-like world! Dan wished for adventure and now he's got more than he bargained for! 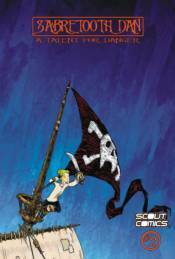 He's on a pirate ship and he's heading for danger, and his world will never be the same! This is the all-ages book that is destined to be a classic. Get on board now!